Easily convert CSV files to JSON files. Is there a better alternative to Jason? Is Jason really the best app in Developer Tools category? Will Jason work good on macOS 10.13.4? 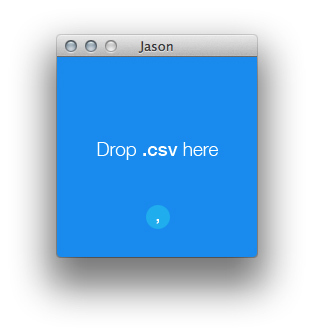 Jason is a little tool that lets you easily convert files from CSV to JSON. Just drag a file and drop it into the application window. The only button sets the delimiter used in the CSV file: comma or semicolon (special for iWorks Number users). Jason needs a review. Be the first to review this app and get the discussion started!